Teens live with their phones in their pockets, and this has created tons of entertainment for you—but it has also created stress. Teens deal with cyber-bullying, digital self-harm, fake accounts, and many other problems that can contribute to anxiety and depression. Most research on digital stress focuses on coping with social stress and cyber-bullying. But other online problems also exist, including digital impersonation, smothering, and hacking. 1. 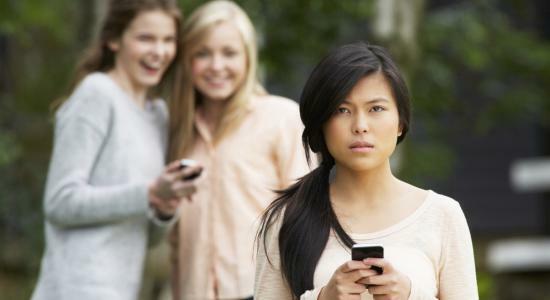 Get help from others—This was the most common way teens approach problems with cyberbullying. Talk to people who care about you: accept their support to “erase the things the bully said.” When you start to surround yourself with people who care about you, you realize how many strengths you actually have. A therapist, teacher, principal, or school counselor could help mediate the situation. Confront the person causing the stress. Tell that person how you feel about what they said or did. You may come to understand the motivations behind the other person’s behavior. Talking with people directly is a challenging prospect—keep in mind that it takes practice. Here are some tips to help you build skills in healthy confrontation. Remember—it’s not your fault to be a target of nasty contact. 3. Cut ties—This was the most common way teens approach digital problems that arise in close relationships. Remember—the digital world is only one part of your life, and you have the right to take time out if online interactions are upsetting you. Turn your attention away from the interaction and stop caring what other people think of you. Interact only with those who would lift you up and encourage you. Report the person causing the stress. To read more in depth about these strategies, check out the original article here. These are just a few suggestions from other teens, but we bet that you’ve found other ways to cope with digital stress. When you feel anxiety caused by social media, what are some ways you handle this stress? Share your strategies below! Previous story Why Not Ask For Help?